It has been suggested that Software developer be merged into this article. (Discuss) Proposed since February 2019. This article is about people who write computer software. For other uses, see Programmer (disambiguation). For someone who performs coding in the social sciences, see Coding (social sciences). "Coder" redirects here. For the settlement in Pennsylvania, see Coder, Pennsylvania. For other uses, see Encoder. British countess and mathematician Ada Lovelace is often considered the first computer programmer, as she was the first to publish an algorithm intended for implementation on Charles Babbage's analytical engine, in October 1842, intended for the calculation of Bernoulli numbers. Because Babbage's machine was never completed to a functioning standard in her time, she never saw this algorithm run. The first person to run a program on a functioning modern electronically based computer was computer scientist Konrad Zuse, in 1941. The ENIAC programming team, consisting of Kay McNulty, Betty Jennings, Betty Snyder, Marlyn Wescoff, Fran Bilas and Ruth Lichterman were the first regularly working programmers. International Programmers' Day is celebrated annually on 7 January. In 2009, the government of Russia decreed a professional annual holiday known as Programmers' Day to be celebrated on 13 September (12 September in leap years). It had also been an unofficial international holiday before that. Some of this section is from the Occupational Outlook Handbook, 2006–07 Edition, which is in the public domain as a work of the United States Government. Computer programmers write, test, debug, and maintain the detailed instructions, called computer programs, that computers must follow to perform their functions. Programmers also conceive, design, and test logical structures for solving problems by computer. Many technical innovations in programming — advanced computing technologies and sophisticated new languages and programming tools — have redefined the role of a programmer and elevated much of the programming work done today. Job titles and descriptions may vary, depending on the organization. Programmers work in many settings, including corporate information technology ("IT") departments, big software companies, small service firms and government entities of all sizes. Many professional programmers also work for consulting companies at client sites as contractors. Licensing is not typically required to work as a programmer, although professional certifications are commonly held by programmers. Programming is widely considered a profession (although some[who?] authorities disagree on the grounds that only careers with legal licensing requirements count as a profession). Programmers' work varies widely depending on the type of business for which they are writing programs. For example, the instructions involved in updating financial records are very different from those required to duplicate conditions on an aircraft for pilots training in a flight simulator. Simple programs can be written in a few hours, more complex ones may require more than a year of work, while others are never considered 'complete' but rather are continuously improved as long as they stay in use. In most cases, several programmers work together as a team under a senior programmer’s supervision. Programmers write programs according to the specifications determined primarily by more senior programmers and by systems analysts. After the design process is complete, it is the job of the programmer to convert that design into a logical series of instructions that the computer can follow. The programmer codes these instructions in one of many programming languages. Different programming languages are used depending on the purpose of the program. COBOL, for example, is commonly used for business applications that typically run on mainframe and midrange computers, whereas Fortran is used in science and engineering. C++ is widely used for both scientific and business applications. Java, C#, VB and PHP are popular programming languages for Web and business applications. Programmers generally know more than one programming language and, because many languages are similar, they often can learn new languages relatively easily. In practice, programmers often are referred to by the language they know, e.g. as Java programmers, or by the type of function they perform or environment in which they work: for example, database programmers, mainframe programmers, or Web developers. When making changes to the source code that programs are made up of, programmers need to make other programmers aware of the task that the routine is to perform. They do this by inserting comments in the source code so that others can understand the program more easily and by documenting their code. To save work, programmers often use libraries of basic code that can be modified or customized for a specific application. This approach yields more reliable and consistent programs and increases programmers' productivity by eliminating some routine steps. Programmers test a program by running it and looking for bugs (errors). As they are identified, the programmer usually makes the appropriate corrections, then rechecks the program until an acceptably low level and severity of bugs remain. This process is called testing and debugging. These are important parts of every programmer's job. Programmers may continue to fix these problems throughout the life of a program. Updating, repairing, modifying, and expanding existing programs is sometimes called maintenance programming. Programmers may contribute to user guides and online help, or they may work with technical writers to do such work. Computer programmers often are grouped into two broad types: application programmers and systems programmers. Application programmers write programs to handle a specific job, such as a program to track inventory within an organization. They also may revise existing packaged software or customize generic applications which are frequently purchased from independent software vendors. Systems programmers, in contrast, write programs to maintain and control computer systems software, such as operating systems and database management systems. These workers make changes in the instructions that determine how the network, workstations, and CPU of the system handle the various jobs they have been given and how they communicate with peripheral equipment such as printers and disk drives. Programmers in software development companies may work directly with experts from various fields to create software – either programs designed for specific clients or packaged software for general use – ranging from video games to educational software to programs for desktop publishing and financial planning. Programming of packaged software constitutes one of the most rapidly growing segments of the computer services industry. Some companies or organizations – even small ones – have set up their own IT team to ensure the design and development of in-house software to answer to very specific needs from their internal end-users, especially when existing software are not suitable or too expensive. This is for example the case in research laboratories. In some organizations, particularly small ones, people commonly known as programmer analysts are responsible for both the systems analysis and the actual programming work. The transition from a mainframe environment to one that is based primarily on personal computers (PCs) has blurred the once rigid distinction between the programmer and the user. Increasingly, adept end users are taking over many of the tasks previously performed by programmers. For example, the growing use of packaged software, such as spreadsheet and database management software packages, allows users to write simple programs to access data and perform calculations. In addition, the rise of the Internet has made web development a huge part of the programming field. Currently more software applications are web applications that can be used by anyone with a web browser. Examples of such applications include the Google search service, the Outlook.com e-mail service, and the Flickr photo-sharing service. Programming editors, also known as source code editors, are text editors that are specifically designed for programmers or developers for writing the source code of an application or a program. Most of these editors include features useful for programmers, which may include color syntax highlighting, auto indentation, auto-complete, bracket matching, syntax check, and allows plug-ins. These features aid the users during coding, debugging and testing. According to BBC News, 17% of computer science students could not find work in their field 6 months after graduation in 2009 which was the highest rate of the university subjects surveyed while 0% of medical students were unemployed in the same survey. The UK category system does, however, class such degrees as information technology and game design as 'computer science', industries in which jobs can be extremely difficult to find, somewhat inflating the actual figure. Computer programming, offshore outsourcing, and Foreign Worker Visas became a controversial topic after the crash of the dot-com bubble left many programmers without work or with lower wages. Programming was even mentioned in the 2004 US Presidential debate on the topic of offshore outsourcing. Large companies claim there is a skills shortage with regard to programming talent. However, US programmers and unions counter that large companies are exaggerating their case in order to obtain cheaper programmers from developing countries and avoid previously employer paid training using industry specific technologies not covered in most accredited degree programs. Other reasons for employers claiming skill shortages is the result of their own cost saving combining of several disparate skill sets previously held by several specialized programmers into fewer generalized multifaceted positions that are unlikely to have enough "qualified" candidates with the desired experience. Enrollment in computer-related degrees in US has dropped recently[when?] due to lack of general interests in science and mathematics and also out of an apparent fear that programming will be subject to the same pressures as manufacturing and agriculture careers. This situation has resulted in confusion about whether the US economy is entering a "post-information age" and the nature of US comparative advantages. Most academic institutions have an Institutional research office that keep past statistics of degrees conferred which show several dips and rises in Computer Science degrees over the past 30 years. The overall trend shows a slightly overall decline in growth (especially when compared to other STEM degree growth) since certain peaks of 1986, 1992, 2002, and 2008 showing periods of flat growth or even declines. In addition the U.S. Bureau of Labor Statistics Occupational Outlook 2016-26 is -7% (a decline in their words) for Computer Programmers because Computer programming can be done from anywhere in the world, so companies sometimes hire programmers in countries where wages are lower. ^ "Programmer vs. Developer vs. Software Engineer". Archived from the original on 10 July 2018. Retrieved 21 April 2008. ^ "Programmer vs. Developer vs. Software Engineer". ^ Fuegi, J.; Francis, J. (2003). "Lovelace & Babbage and the creation of the 1843 'notes'". Annals of the History of Computing. 25 (4): 18–26. doi:10.1109/MAHC.2003.1253887. ^ Fuegi, J.; Francis, J. (October – December 2003). "Lovelace & babbage and the creation of the 1843 'notes'". IEEE Annals of the History of Computing. 25 (4): 16–26. doi:10.1109/MAHC.2003.1253887. ^ "Memorials". Eniacprogrammers.org. Retrieved 11 October 2018. 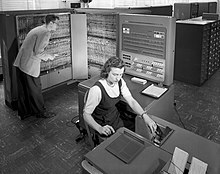 ^ "ABC News: First Computer Programmers Inspire Documentary". Abcnews.go.com. 4 December 2007. Retrieved 3 October 2010. ^ "International Programmers' Day". Archived from the original on 3 January 2018. Retrieved 19 September 2018. ^ Elmer C. Kubie (Summer 1994). "Recollections of the first software company". Annals of the History of Computing. 16 (2): 65–71. doi:10.1109/85.279238. ^ Rebello, Kathy; Schwartz, Evan I.; Verity, John W.; Lewyn, Mark; Levine, Jonathan (28 February 1993). "Is Microsoft Too Powerful?". Businessweek Archives. Bloomberg Businessweek. Retrieved 26 September 2014. ^ Hardiman, Nick (24 July 2014). "A portrait of the modern cloud developer". TechRepublic. ^ "Software Engineer Skills and Responsibilities". ^ Eric Sink. "Small ISVs: You need Developers, not Programmers". Sourcegear. Retrieved 6 June 2008. A programmer is someone who does nothing but code new features and (if you're lucky) fix bugs. They don't write specs. They don't write automated test cases. They don't help keep the automated build system up to date. They don't help customers work out tough problems. They don't help write documentation. They don't help with testing. They don't even read code. All they do is write new code. ^ "BBC Bitesize - GCSE Computer Science - Programming software and the IDE - Revision 4". www.bbc.co.uk. Retrieved 16 September 2017. ^ Shankleman, Martin (1 July 2010). "'One in 10' UK graduates jobless" – via www.bbc.co.uk. ^ "CPD: October 8, 2004 Debate Transcript". www.debates.org. Retrieved 13 February 2017. ^ "After the Dot-Com Bubble: Silicon Valley High-Tech Employment And Wages in 2001 and 2008". www.bls.gov. ^ "Computer Programmers : Occupational Outlook Handbook: : U.S. Bureau of Labor Statistics". www.bls.gov. Thompson, Clive (2019). Coders: The Making of a New Tribe and the Remaking of the World. Penguin Press. ISBN 978-0735220560. Look up programmer or coder in Wiktionary, the free dictionary.